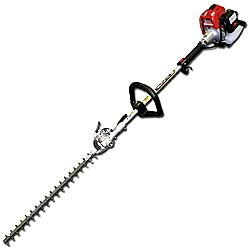 RedMax hedge trimmers are the preferred choice for landscaper professionals and discriminating homeowners. The articulating LRTZ2401 is designed for professionals who require a long reach trimmer for tall hedges or difficult cutting angles. The combination of a 16" double blade with the 59" shaft gives the operator an additional 6 feet of trimming manueverability. Its Strato-Charged engine has ultra-low emissions that doesn't compromise power. Steel-needle sealed bearings on the blade connecting rods extend the life of the LRTZ2401 and enhance performance. A vibration-dampening system on the rear handle reduces operator fatigue. The engine is more powerful and produce less emissions than a regular engine. * Please call us for any questions on our hedge trimmer pole serving Honolulu, Waikiki and surrounding communities on Oahu.